Orleans, La., announced recently the firm will begin construction soon on a new $8-million ship- yard to build river hopper barges. The yard, the company's third, will be located at Demopolis, Ala., on the Tennessee-Tombigbee Wa- terway. Besides calculating the MIP ( pressure), typical pressure shown on the digital instri time/pressure curve on an < scope. Further options include polari and printer unit. versify from their traditional deck and tank barges because of the strong demand recently for hop- per barges to move coal. Bergeron, with yards in St.
Bernard, La., near New Orleans, and Port Bienville, Miss., is re- portedly the largest builder of deck barges for the offshore oil industry. The firm constructed 58 deck barges in 1980. Bergeron Barges Inc., a subsid- iary of Bergeron Industries. Con- 'MIP calculator NK-4' ting vessels, ;an indicated 'ametres are 3nt, and the ional oscillo- le price, is to to the calcu- enabling the tion system, type camera struction on the yard is scheduled to begin soon. Production is set to start in March 1982 of large hopper barges with a cargo ca- pacity of about 3,000 tons, or ap- proximately twice the capacity of normal river hopper barges. Edward L. Shearer, vice presi- dent of sales, said the yard will initially produce about 10 barges per month. 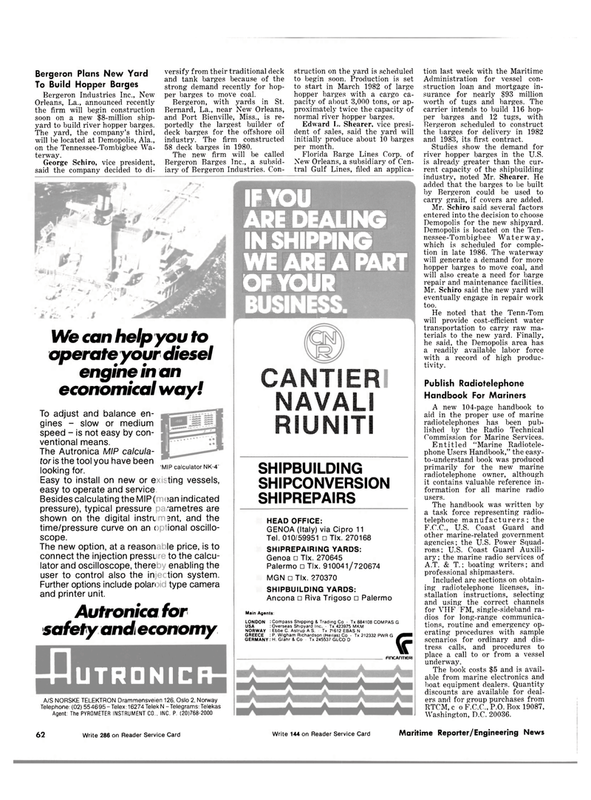 Bergeron scheduled to construct the barges for delivery in 1982 and 1983, its first contract. Studies show the demand for river hopper barges in the U.S. is already greater than the cur- rent capacity of the shipbuilding industry, noted Mr. Shearer. He added that the barges to be built by Bergeron could be used to carry grain, if covers are added. Demopolis for the new shipyard. Demopolis is located on the Ten- nessee-Tombigbee Waterway, which is scheduled for comple- tion in late 1986. The waterway will generate a demand for more hopper barges to move coal, and will also create a need for barge repair and maintenance facilities. Mr. Schiro said the new yard will eventually engage in repair work too. He noted that the Tenn-Tom will provide cost-efficient water transportation to carry raw ma- terials to the new yard. Finally, he said, the Demopolis area has a readily available labor force with a record of high produc- tivity. Entitled "Marine Radiotele- phone Users Handbook," the easy- to-understand book was produced primarily for the new marine radiotelephone owner, although it contains valuable reference in- formation for all marine radio users. A.T. & T.; boating writers; and professional shipmasters. Included are sections on obtain- ing radiotelephone licenses, in- stallation instructions, selecting and using the correct channels for VHF FM, single-sideband ra- dios for long-range communica- tions, routine and emergency op- erating procedures with sample scenarios for ordinary and dis- tress calls, and procedures to place a call to or from a vessel underway. We can help you to operate your diesel engine in an economical way!